What is Covered in the SAT Critical Reading Section? Disclaimer: This article is for the 2005 SAT. Click here to learn about the new, 2016 SAT. Let’s be real—your student probably moans and groans when they hear the words “Critical Reading.” Who would blame them? After all, the Critical Reading Section is arguably one of the drier sections of the test! The vocabulary words and the passages can definitely drain the psyche without proper training…but that shouldn’t stop your student from conquering the test. There are plenty of SAT resources out there full of great Critical Reading strategies for your student, but before you buy all the books, and get your student a private tutor, you should probably educate yourself about the SAT Critical Reading Section, and make sure your student knows exactly what to expect. After reading this post you’ll basically know everything. So sit down and stay awhile, because I’m going to show you exactly what is covered in the SAT Critical Reading section. What does the test look like? Here’s a quick breakdown. Let’s start off with the big picture before I get into all the specifics. 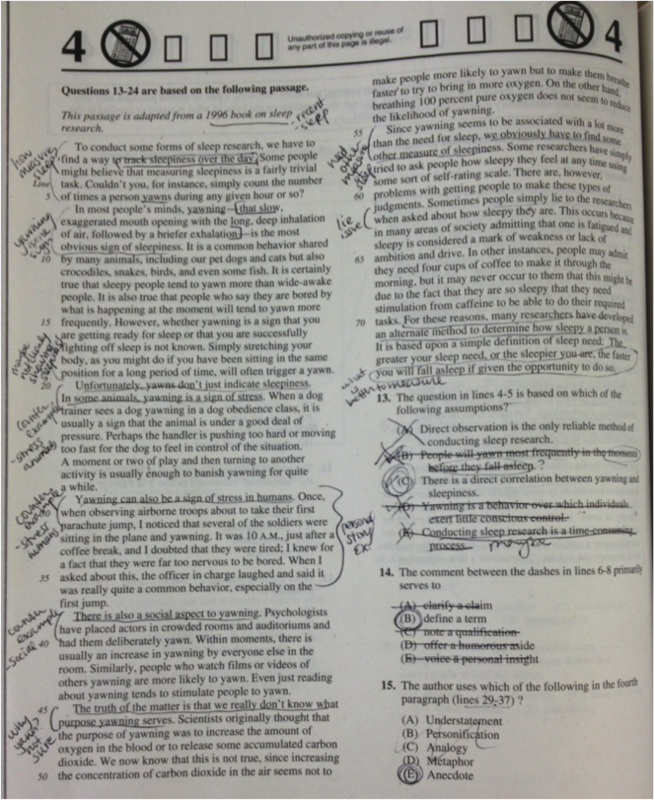 Every question in the SAT Critical Reading section is multiple choice, and there are essentially two categories of questions asked—sentence completion (vocabulary) questions, and passage-based reading questions. 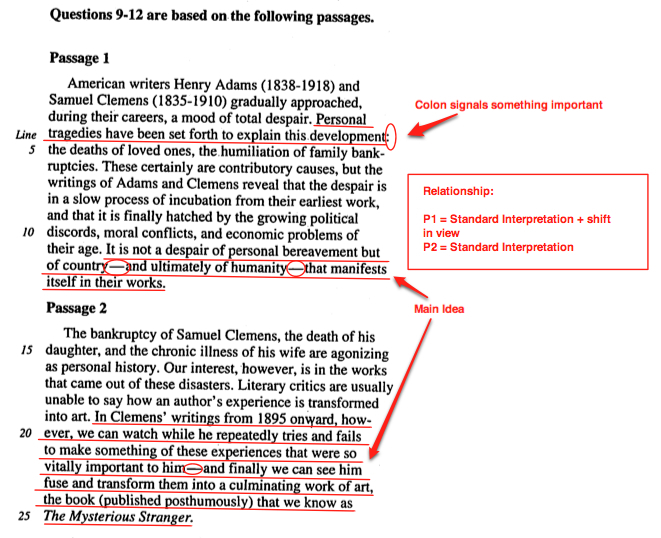 The passage-based reading questions can be broken down even more by question type, and by passage type. Okay, now let’s take a closer look at these question categories. The passage based reading questions are definitely the more difficult of the two question categories—it can be pretty easy to doze off when reading a passage about the history of traffic lights. It also doesn’t help that the passage-based reading questions make up a majority of the Critical Reading section– but nonetheless your student can power through! The passages are taken from a number of fields, including, but not limited to, natural sciences, humanities, social sciences and literary fiction. This sounds like a whole lot to take in, but I promise that your student can handle it! After taking a few practice tests and getting an idea of how these different question types look, they’ll absolutely be able to identify them on the exam and apply the appropriate strategy. All of these question types will be asked, but your student will have to be able to answer these types of questions as they apply to different types of passages. So, let’s take a look at these passage types! The short passages are probably the least intimidating of the passage types. After all, they are smaller, easier to read, and are followed by fewer questions. These passages are typically not too in-depth, and are often informational texts, instead of made-up, fictional stories. Expect to see a few simple reading comprehension questions, and maybe one or two questions about the main idea of the passage, at the end of the reading. Doesn’t sound all that bad, right? Well, don’t get too comfortable, because there’s more! The long passages are just a bit more complicated than the short passages. But don’t panic! Stay with me. The long passages are typically much more in-depth than the short passages. The long passages are often drawn from fiction and literature, which can be a bit more tricky than simple informational texts, since they are often not as straightforward and the main idea of the passage isn’t always cleanly spelled out. Your student should expect to see all question types following these passages, including main idea questions, plot summary questions, questions about the author’s views, and questions about individual characters. Don’t let these passages scare you though! They may look big, tough and mean, but really they’re just like the small passages—your student will just have to pay attention for a little bit longer, and answer a few more questions. 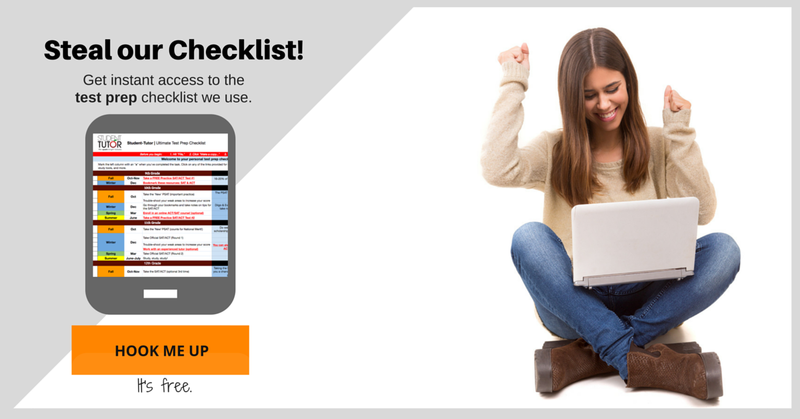 Click here for a free SAT e-book that outlines 13 proven test-taking strategies! Two passages?! I thought one was bad enough! But don’t freak out! It’s not as bad as it sounds. In fact, they’re no more difficult than the short or long passages. The dual passages come in pairs, and are either both long or both short. Depending on the length of the passages, you are more likely to encounter different question types (see previous two sections). After reading each passage, your student will first be asked a series of multiple choice questions based on the first passage, then on the second passage. After answering questions about each individual passage, your student will encounter a few questions that apply to both passages. So basically, they’re exactly like the first two passage types, but with one additional type of question. You can relax now–the scary stuff is over. The sentence completion questions can be a huge lifesaver for your student, especially if they memorize their SAT vocabulary—the sentence completion questions are definitely much easier to study for, but what exactly are the sentence completion questions? What do they look like? They’re pretty much exactly what they sound like! Your student will be presented with a sentence with one or two blanks. It is your student’s job to select the vocabulary word(s) from the list of answer choices that best complete the sentence. This section tests not only your student’s breadth of vocabulary knowledge, but also their ability to use context clues to eliminate wrong answer choices, isolating the best choice. Sounds pretty simple right? Be careful though! Some students spend so much time studying reading and math strategies that they forget to memorize their vocabulary words…but these questions really do make up a significant portion of the SAT Critical Reading section. That probably felt like a whole lot of information, right? I promise that it is manageable, and that your student can do it. Making sure your student is well versed in the SAT, and knows what to expect on testing day is the first step towards getting a good score. The next step is learning how to strategize! Check out our article on the 5 key SAT Critical Reading strategies, designed to help boost your score!